Evolving Styles is a live street art auction, inviting the finest street artists from around the world to paint live and auction their art off, all in the name of charity. In association with street wear label Boxfresh, Cargo’s outside space will be turned into a live art studio / sealed auction house, but unlike Christie’s or Sotheby’s, this auction house has a BBQ, the best DJs playing out and world-famous artists creating original work to auction off on the same night. 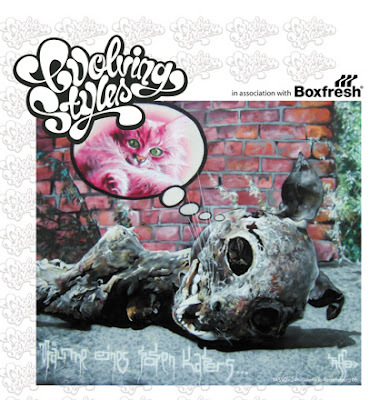 Evolving Styles sees acclaimed artists such as the legendary Lady Pink (New York), Mr Kern (France), Herakut (art duo, Germany), Nick Walker (Bristol), Stormie (Australia), Part 2 (UK) to name a few, paint on 6 canvases each. At 8p.m. a sealed auction begins where anyone can bid as little or as much as they want for their preferred canvas. At 9p.m., the winning bidders will get to take home their exclusive one-off pieces of art with them that night. The event kicks off tonight Friday July 6 at 6pm with the notorious German artist TASSO and British freestyle artist Xenz creating art live at the auction. Free admission.